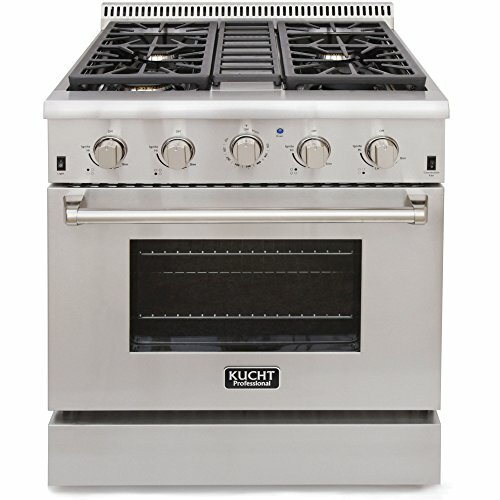 The Kucht KRG3080U is a 30" flat top range with convection oven. This unit features three heavy duty powder coated cast iron grates for the stovetop. The burner pans are gloss black enamel. The stove is lined in blue enamel. The sturdily constructed cast iron grates are easily removed for clean-up. The black enamel burner pans can be wiped out before spills become permanent headaches. The three cast iron grill portions give you a completely flat cooking top so pots can be slid off the heat to cool. Every gas port features an electronic ignition with automatic re-ignition should you have a spill and douse your flame. No Timer? No Temp Sensor? Heat and electronics don't mix. Many programming devices on stoves fail when exposed to heat over and over again. The 22,000 BTU convection oven offers 4.2 cubic feet of baking space. This oven is not only powerful but extremely well lit, so you can monitor your baked goods and avoid burned on spills or scorched food. In addition to plenty of baking power, this stove offers 15,000 BTU tube burner broiler inside the stove. Your Kucht gas range offers excellent cooking power and plenty of heat. In the convection oven, you'll want to use shallow pans so air can move freely. Additionally, be sure to give your pans plenty of room. In many stoves, oven racks slide in and out of the oven on ridges molded into the walls. While this is generally effective, over time the racks can scuff the enameled coating of the stove and put your oven at risk of corrosion. The Kucht KRG3080U will burn either natural gas or propane. You will need to make this specification when you order your stove, though there are conversion kits available in the event you plan to move with your stove. The Kucht KRG3080U is just a stove. There is no digital clock, no timer, and no way to program anything. While some may see this is a con, it's important to note that there is no mother board that will fail on this stove. Simple design. This stove will match nearly any decor thanks to the stainless steel finish and smooth front panels. And the blue oven is a pleasant and pretty surprise! Flat top. The center cast iron grid makes it possible to move pots off the burner easily and keep them flat and level. Adjustable convection fan. The convection fan can be switched off at the front of the stove for soufflés and flans. The center cast iron grate on the cooktop can't be removed until you remove one side of the burners, so if you have a spill in the center you can't get to it until the whole cooktop has cooled. Burner power is intense, and there is only one burner on the cooktop that can be reduced to keep your food at a slow simmer; be prepared to stir and move things around to avoid scorching. The walls of the oven are very thick and offer great insulation, but this does reduce the space you can use in the oven opening. For a stove with a large footprint, the oven is rather small. This oven can be noisy on the top and the bottom. Convection fans are powerful tools, and the sound of air movement will always contribute to ambient noise in your home. Additionally, many cooks enjoy the roar of the gas burners on the cooktop. The Kucht KRG3080U may be a great purchase for anyone wanting to move into professionally quality cooking gear. Using a separate timer and thermometer may take some getting used to, but you'll get more accurate readings and have fewer electrical problems with this simple, sturdy cooking tool. You'll need to hire a professional installer and will probably need professional movers to get this unit into your home and set up.